Undoubtedly one of the top tourist attractions in Puerto Rico, a trip to the Casa Bacardi Visitor Centre is a must for travellers to San Juan. 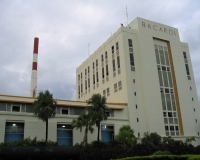 Following their exile from Cuba in the 1950s, the Bacardi family moved to Puerto Rico and set up a small rum distillery on the outskirts of San Juan. Today, that small distillery has grown into the largest in the world, producing a jaw-dropping 100,000 gallons of rum per day and 21 million cases per year. Tours of the Casa Bacardi Visitor Centre last about an hour, as visitors are shown around a variety of exhibits and vintage rum stills. They will also be informed about the history of Bacardi rum (including a short movie). The tour culminates in a visit to an on-site, classically-styled bar, where a bartender will show you the proper methods of preparing Cuba libres and mojitos. The best part? All visitors receive two complimentary drink tickets, which they can cash in on ice-cold Bacardi-based drinks. There is also a gift shop located on the premises, a perfect place to pick up some rum or Bacardi apparel for friends back home.